Coming from a large Italian family, I’ve had my fair share of delicious foods. Pre-keto, I was all about the traditional necessities: baked ziti, crusty bread with a sweet olive oil and herb blend, and most importantly – the delicious soups. Now surprisingly enough, my favorite soup didn’t come from an old family recipe box. In fact, it wasn’t even something my family made, ever. One summer dinner when I was using up my influx of holiday gift cards, I discovered the Zuppa Toscana at our local Olive Garden. Zuppa Toscana directly translates to “Tuscan Soup” in Italian. With thick slices of potato, slivers of wilted kale and chunks of flavorful Italian sausage in a pleasantly spicy broth, I was immediately hooked. Unfortunately, potato is definitely not an option when following a ketogenic diet. This got me to thinking about some of my past creations in which I needed a likely substitute. I know – cauliflower! By substituting potatoes for cauliflower, I was able to recreate the most delectable soup known to man (ok, me). This soup is absolutely perfect with some shavings of fresh parmesan on top. Throw a nicely dressed salad on the side and you’ve got an awesome lunch or dinner! 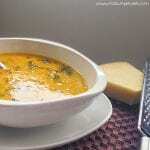 The best part of this soup is that, unlike some, it doesn’t have to cook for hours to develop a really great flavor. You can essentially cook all of the ingredients and have it ready within an hour. It also doesn’t hurt that this makes multiple meals that you can freeze or enjoy all week. As always, the broth you choose will have some impact. Luckily in my case, I had some spare bone broth that I rendered from a rotisserie chicken carcass. So worth the extra step, never just throw those bones away! So, what are you waiting for? Get on that Zuppa Toscana! Macro/Nutrition: For 1/8 of the Zuppa Toscan recipe, this come out to roughly 243 calories, 4 carbs, 3 NET carbs, 21 grams of fat , 1 grams of fiber and 9 grams of protein per serving! Brown sausage in saucepan with onion and garlic. After meat is cooked through, deglaze pan using chicken stock (deglazing means just adding liquid to a hot pan to remove all bits of food). Add water, crushed red pepper, salt and pepper. Simmer broth for half hour. Add butter, kale and cauliflower and cook for roughly 15 minutes, until cauliflower and kale is tender. Minutes before serving, add a splash of heavy cream. Do you miss a meal from a specific restaurant? Need help making it keto-friendly? Comment below! Want a printable version of all of my recipes? Get the entire collection for just $9.99 + free updates every time I add a new recipe. Your purchase helps keep No Bun Please up and running for absolutely FREE! Keto Alcohol Guide: Which Drinks are Low Carb? The contents of No Bun Please are strictly opinion, though based on research and personal experience in my journey. I am not a doctor and the information on this site should not be taken as medical advice. Always consult with your doctor or medical professional before starting any new program.